2K is finally pulling the plug on Evolve, the ambitious 4v1 multiplayer monster hunting game from Left 4 Dead veterans Turtle Rock. Dedicated servers will shut down September 3, the company announced Friday. 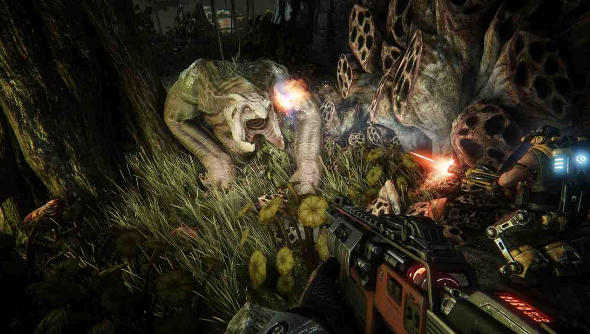 That will mean the end of several of Evolve’s key features, notably Evolve: Stage 2, the free-to-play version of the game that launched back in July 2016. Shutting down the dedicated servers will mean Ranked Hunt and leaderboards will no longer be available. As of July 2, virtual currency bundles will no longer be available in Evolve’s in-game store, and the store itself will shut down with the servers September 3. Find a replacement for Evolve on our list of the best multiplayer games on PC. However, players who have the retail version of the game, Legacy Evolve, will still be able to play. Peer-to-peer matchmaking and the party-up feature will still be available for Quick Play, Evacuation, and Custom games. You’ll still be able to play in single player versus AI and maintain access to all the hunters, monsters, DLC, skins, and badges you’ve either unlocked or purchased. Despite a compelling core idea, initial design decisions around unlocking content wound up holding Evolve back when it launched, and the game struggled to build a consistent audience. Player numbers went up when Evolve launched its free-to-play version, but the revival was short-lived, and 2K pulled Turtle Rock off the game a few months later. Since then, Turtle Rock has been developing VR games, including licensed Blade Runner and Stranger Things experiences for Oculus and GearVR.